"This kind of sounds like one of those 'Intel-approved' articles." No it doesn't. It's merely pointing out the results that are out there. Intel is winning hands down in performance so its logical that the review sites would be drooling all over it. "Basically, there are two classes of SAP-SD 2-tier submissions - "fast" with response time around 1 second and "throughput-oriented" with response time around 1.6-2 seconds." Could be true as SUN also activated Unicode (15% additional Load). In the past HP used to publish their disk setup and always used RAID0. Although i do not know much about SAP benchmarks, i tend to agree with you. In 15 years working in IT, i have yet to see a speed bump on this kind. 119% is a lot of improvement. 20% was very nice already, 119% it is just too good to be true. Several were announced in several fields, The Willamette Core was supposed to be a big bang, and advertised as it. And others of course. Anyway, the same results could be achieved with a web server. You just need to know how to tinker. 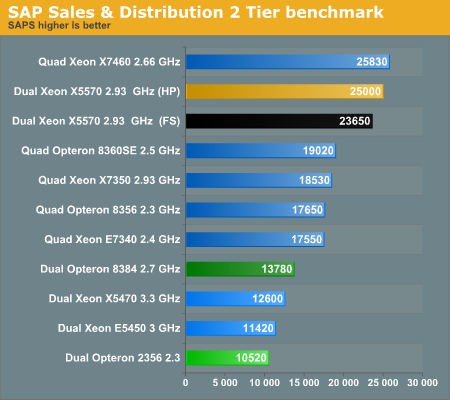 I think HP benchmarks are well tuned both on AMD and Intel Platform.